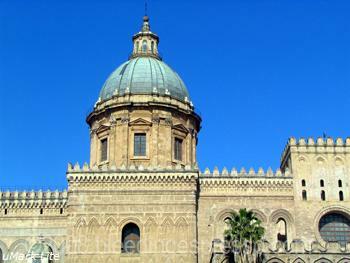 A few weeks ago, we started at Teatro Massimo, and then we started a walking tour up Corso Vittorio Emanuele. Now, after passing through the Porta Nuova and seeing Quattro Canti and La Fontana della Vergogna/The Fountain of Shame, we have arrived at the Duomo. Absolutely one of the most beautiful buildings I’ve ever seen. 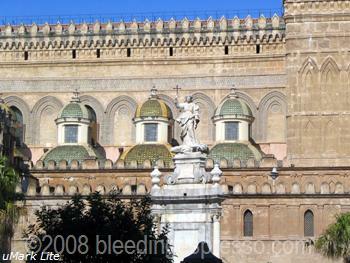 Part of what makes the Duomo so unique is its many architectural influences that reflect Sicily’s history as a territory that has seen a truly impressive number of leaders–check out this busy flag of the Kingdom of the Two Sicilies (thanks Paulus Maximus!). The Duomo was built by Normans in 1184 on the site of a Muslim mosque that had been built over an early Christian basilica. During the 13th and 14th centuries, Gothic additions were added to the exterior and then the Spaniards added a Catalan touch in the 15th century. Neoclassical elements were introduced both inside and out during the late 18th and early 19th century by architect Fernando Fuga of Naples. You can read much more about the architectural details and see great photos of the Duomo, especially of the interior, here. 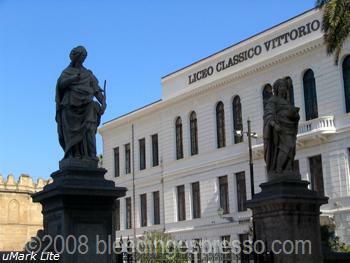 And just for fun, check out this liceo (equivalent of a US high school) that overlooks the Duomo. Somehow I don’t think concentration would come easily for me with the gorgeous Duomo outside. gardens and fruits and veggies, oh my! Happy Memorial Day to those in the US! Hope you have your poppy! 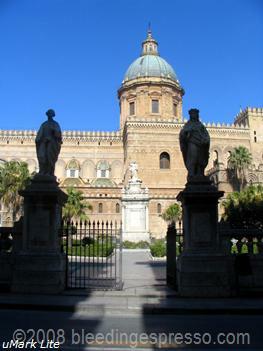 Thanks again for continuing to educate us in the history and art of Palermo! Beautiful pictures. Thanks Gil; glad you enjoyed! I have really enjoyed this series! nyc/caribbean ragazza’s last blog post..Are bloggers narcissists blabbering on about nothing? *So* happy to share with you Nova! Anch’io have enjoyed the Monday’s Palermo. 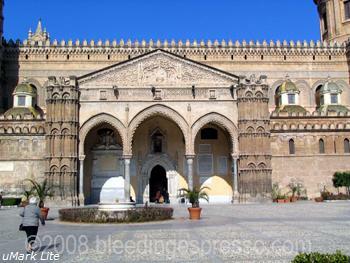 I realized how much I missed and hope to visit all those places the next time I’m in Sicily. Grazie mille per being our tour guide and taking the time to educate us on the history. I was tagged, so now I’m tagging you. What a simply gorgeous building. I can’t even imagine it. I’d so love to go there. It is truly amazing Jen; I hope you’ll get to see it in person someday! A few more Palermondays to come Jackie! 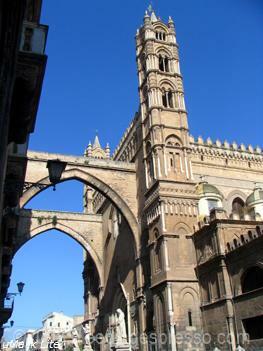 The Duomo is so easy to find too…right on the main street! Sognatrice, this place is so amazing, thank you for sharing it with us! And I love the historylessons that go along with the photos, that really brings it all together!